« Offsite Book Sales: Entanglement: a poetry reading. 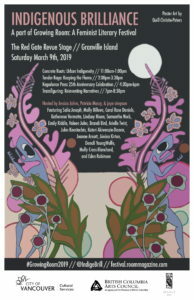 Indigenous Brilliance is celebrating their one-year anniversary as a reading series with brilliant poets, writers, singers, visual artists, academics, beadworkers, medicine makers, and more in a day-long event. This major event will feature four readings, and will host Indigenous women/2SQ vendors, entrepreneurs, and artists throughout the entire day. Officially opening Growing Room’s Indigenous Brilliance is Salia Joseph. Concrete Roots dives into the relation of Urbanization and Indigeneity, and how Indigenous brilliance can take root anywhere we choose to exist. Featuring Molly Billows, Carol Rose Daniels, Brandi Bird, Lindsay Nixon, and Samantha Nock. How do we balance our rage with the gentle side of us? These exceptional creators lend us the privilege of sharing their Tender Rage: ways they love and yell, care and seethe, comfort and fume. Fire can both warm and burn you, and Eden Robinson, Valeen Jules, Katherena Vermette, and Arielle Twist know just how to do both. Kegedonce Press is a formidable literary press that has championed and published Indigenous authors and artists since 1993. Come and hear Jules Koostachin, Kateri Akiwenzie-Damm, and Joanne Arnott as we come together to celebrate their 25th anniversary. Indigenous brilliance comes from all kinds of places, and that brilliance is big, bright, and transformative. Join Jónína Kirton, Denali YoungWolfe, Emily Riddle, and Molly Cross-Blanchard as they share works that subvert and reinvent narratives, and words that open up worlds. Kateri Akiwenzie-Damm is an Anishinaabe writer, poet, editor and the founder and managing editor of Kegedonce Press, an Indigenous publisher based in the territory of her people, the Saugeen Ojibway Nation in Ontario. Kateri’s recent collection of short stories, The Stone Collection, received a starred review from Publishers Weekly and was a finalist for a Sarton Literary Award. Molly Billows is swift waters, secrets and salal berries. Northern Coast Salish (Homalco), they are a queer, trans nonbinary, urban Indigenous, spoken word poet and facilitator. Valeen Jules is a radio producer, youth outreach worker, spoken word artist, community organizer and full-spectrum doula from the Nuu-chah-nulth and Kwakwaka’wakw nations. Jules Arita Koostachin, owner of VisJuelles Productions Inc. is MoshKeKo Cree and a band member of Attawapiskat First Nation, located in what is now called Northern Ontario. Jules is a PhD candidate with the Institute of Gender, Race, Sexuality and Social Justice at the University of British Columbia. A survivor of the child welfare system, adopted and raised in Nêhiyaw culture Denali YoungWolfe is now a UBC graduate student & public scholar focused on asserting and disseminating healthy narratives of Indigeneity for future generations. Patricia Massy is Cree/English and a member of the As’in’i’wa’chi Ni’yaw Nation. She is the proprietor of Massy Books, a 100% Indigenous owned bookstore operating on the traditional, ancestral, unceded, and occupied territory of the xʷməθkʷəy̓əm (Musqueam), Sḵwx̱wú7mesh (Squamish), or sel̓íl̓witulh (Tsleil-Waututh) Nations. Emily Dundas Oke is an emerging artist and curator. A 2018 graduate of Philosophy and Visual Art (BA) from Thompson Rivers University, Emily has exhibited nationally and internationally. She is currently an artist in residence at Nida Art Colony (Lithuania). She is a grateful Cree, Métis, Scottish, and English visitor on the unceded and ancestral territories of the xʷməθkwəy̓əm (Musqueam), Skwxwú7mesh (Squamish) and Səl̓ílwətaʔ/Selilwitulh (Tsleil-Waututh) Nations.